Irish rugby shirts feature design that include Celtic knots and shamrocks along with the logos from Guinness and Jameson. These Irish rugby jerseys are available in both long sleeve and short sleeve designs. These Irish rugby jerseys have traditional styling and will look handsome during a match or for casual wear. In addition to the Irish rugby shirts on this page, The Irish Gift House also offers an Irish cycling jersey with a Celtic design. 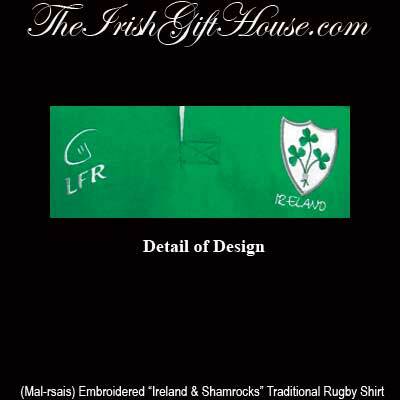 Irish rugby shirt is a long sleeve Kelly green and white design that features an embroidered Ireland and shamrocks motif. 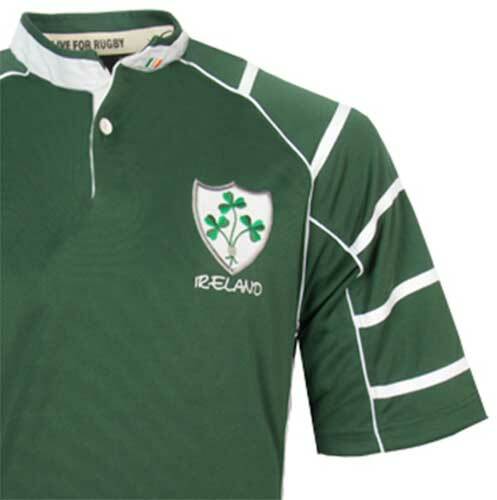 Irish rugby shirt is a traditional short sleeve design in Kelly green that features white accenting along with an embroidered Ireland and shamrocks motif. 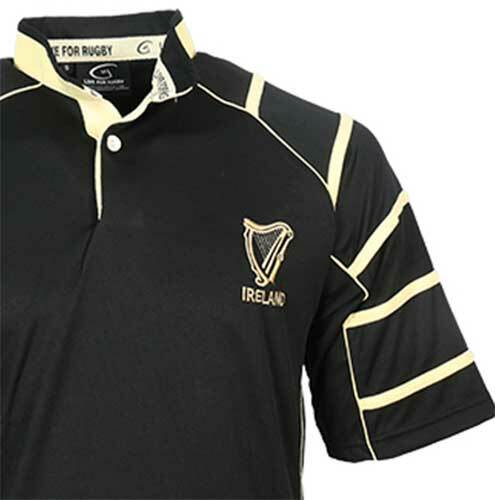 Irish rugby shirt is a short sleeve black jersey with cream accenting along with Ireland's national symbol, the harp. Guinness rugby shirt is a long sleeve design that is enhanced with a pint along with the iconic toucan. 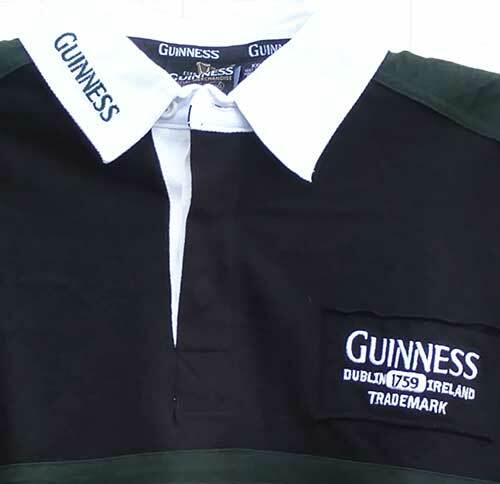 Guinness rugby jersey is a short sleeve shirt that features a breathable fabric. 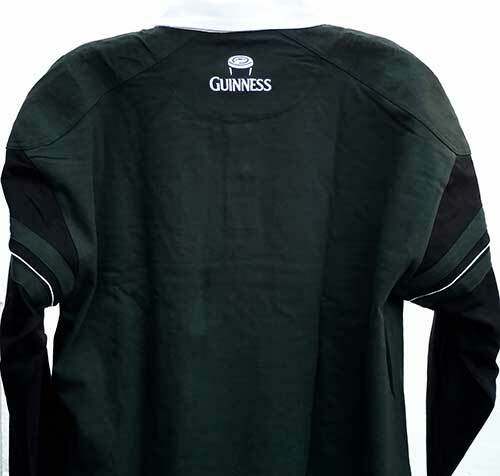 Guinness rugby shirt is a green and black long sleeve jersey that features an embroidered Guinness pint. Irish cycling jersey features a Celtic design of green on green Trinity knots. Irish hockey jersey features the Guinness harp design on this black and green embroidered shirt. In addition to the rugby shirts we have over a dozen more categories of clothing at The Irish Gift House that include Irish t-shirts and shamrock ties. Of these many categories the Irish flat caps and the Irish sweatshirts have proven to be among the most popular but we are amazed how quickly the shamrock socks are gaining. We would be happy to ship a pair to you with your next order. Another popular sport in Ireland is soccer and if that is you game you may wish to take a look at our selection of Irish soccer jerseys.